Syawal Note is another little project to uplift the spirit of the children at the ward. The project is simple..sending a care pack as well as a few Eid cards for the kids at oncology ward. Few public figure has been approached to get the cards signed by them. Who are they... hmm.. I keep it till the end to let you all know... praying hard that they will sign it..insyaAllah..
Preparations are on going.. insyaAllah ,the target date to deliver the items is either 12th or 13th September 2009. The beneficiaries..again, the oncology ward of UMMC and PPUKM. Why these wards are getting it.. mainly due to the relationship that I have made with them. Therefore.. if there are anyone out there, especially doctors or just anyone who knows who I can approach, who think these little projects can give an impact to your patients, family members or friends..... kindly contact me yea. Seriously... I would like to expand it to others.. I will think of something to cheer the kids.. we can start it small... As I wrote before, there is no harm in having a dream.. as Allah will help to make it happen, insyAllah..
Adik Hafiz is out from the ICU, after going through a difficult and painful moments. He is in so much pain, thus, he himself can control the amount of morphine to be injected to his body. I can't explain much on him.. as I have not spend much time with him yet. However, finally... he is no longer shy with me.. and wrote a list of things that he wish he could have. He is a nice, humble, shy 12 years old boy..
His wish is a list of PS2 games... the kids at the hospital really "ADORE" PS2, as they can't have a normal play time like other kids... but WAIT, most of the kids I know like play station, (err...adults too right ;)).. After all, they are CHILDREN, aren't they.. and u know what, I thank God he did not tell me to get rid of his chemo pod.. Adik Hazim did say that.. Being 12 years old .. these are the things that makes him happy..
Snowflakes are beautiful. Every snowflakes are different as it comes in a variety of sizes and shapes. Subhanallah.. all praise to Him. As I remembered clearly, watching the snow falling from the sky brought me a feeling of calmness, tranquility and serenity. So are we. We all are different. Gender, religion, race, backgrounds, beliefs.. to name it a lot. When I decided to concentrate on making programmes for the children who I believe should be given chance to laugh, have fun and smile , never that I thought I would meet so many wonderful people who I would say... just like the snowflakes.. unique, beautiful and full of love. Allah SWT has been blessing me with so many surprises.. Alhamdulillah..
Will post on new projects coming soon.. "Syawal Note", " Cinderella Day Out" and " You are in Our Mind". Now it's time to move on..
Last Sunday, I went to visit Adik Hazim at his home. Alhamdulillah.. he looks fine, and smiling all the way. The siblings are fine too... in fact, they were teasing each other. The mother asked them to behave as I was around.. but then, kids being kids... quarelling, fighting and teasing are NORMAL. That is what I have wished for.. for Adik Hazim to have a normal life. Despite of being sick, and financially challenged, I wish these children can have a normal life. Normal life is not a perfect life... we are just human, ain't perfect at all. But to have a normal life is something that everyone would wish for. Seeing them laughing, smiling, talking, and in fact quarelling, makes me realized that I can move on to the other children. I will always keep in touch with Adik Hazim and his family, as they have a special place in my heart. I do have 2 other projects in mind.. guess I keep on having new projects :p I am already in discussion for " Syawal Note". Will post some details on that. Check out next post on "Syawal Note" and " Cinderella Day Out"
Does anyone remembers "Care Bears " ? That is one of my favourite cartoons during my childhood days. Still love it though ;) " Care Bears " are a group of sweet, cute bears that have their own super power and speciality, that will always come together in times of hardship, spray out their power that turns into a rainbow. Difficult to explain.. hehe, but those who have watched " Care Bears" would know what it is. You know what.. I have CARE BEARS too :) Everyday, there will be a new "Care Bear" extending their support, strength and love to every project that I am doing. Some of them are people that I have known all my life and..some are those who I have not even met yet! SUBHANALLAH... All praise to Him. I believe behind every obstacle, there will be a beautiful rainbow. True enough .. it is always there, just keep on having faith in Him. "Serunding Drive" is on the right track. Delivery will be on the 1st Ramadhan 1430 / 22nd August 2009. The beneficiaries are the Children Oncology Ward of PPUKM and UMMC. My friend asked me.. " what is that ? " Here it goes.. as ward visit has to be postponed due to the H1N1 pandemic, I want the kids and families know that, they are in our mind. Hospital food are not that bad nowadays, but if there is an extra dish, I think that would be great. My target is to deliver this to Children Oncology ward at UMMC & PPUKM. My aunty used to say.. it's not how expensive your gift is, it's the thought that counts..
Alhamdulillah, all praise to the Almighty, the event went well. 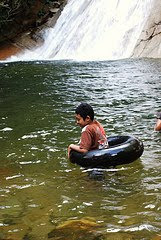 The purpose was very simple, to fulfill Adik Hazim's wish to go to the waterfall. As I wrote earlier in this blog, I am a person who believes, every child has the right to have a happy and enjoyable life despite of anything. Happiness is a thing that can not be measured. InsyaAllah, I really hoped that Adik Hazim & his family really enjoyed the camping trip that we had last weekend to Lata Berembun, Bentong, Pahang. The camping trip was an event full of love and care. Those who participated were actually given a last minute notice. My apologies, but making programme with a childhood cancer patient, all decisions can only be finalised depending on his health condition. Regardless the last minute notice, everyone were great. I really LOVE all of you. May Allah bless you. A friend flown in from Bangkok, a childhood friend who volunteered to be a photographer, Redah 4x4 that I have not known earlier.. and of course this would not have happened if a dear friend of mine did not call me up on that particular night, asking me to write a letter to Redah 4x4. Syukur Alhamdulillah, all went well. Adik Hazim said "sekali sekala macam ni seronok" , enjoying every moment with his family and friends ( new friends I woud say ). We went to waterfall, played Saidina and UNO, had bar-b-que and the most of all... we had FUN!! His fight against Hodgkin Lymphoma continues. He will undergo a Radiotherapy session, most probably in September. To Redah 4x4, you guys are GREAT, FUNNY and I definitely will look for you again. To my 3 dear friends, I love you and thank you for supporting me. To others who endlessly giving me support, you are superb. May Allah bless you all. InsyaAllah.. I am very thankful that Allah always help me in any programme that I have planned for the children. When we were planning for the camping to fulfill Adik Hazim's wish, I was very confident in saying "jangan risau lah.. nanti adalah duit tu " Tell the truth, I have not collected any single cent from anyone until I received a sms few days ago from someone who has been very generous to sponsor the trip. Subhanallah.. I've been with Adik Hazim and his family for 8 months now. From time to time,I will ask the nurses at the hospital if there are any other kids who need my attention ( meaning.. they are in serious condition ) The nurses asked me to concentrate on 2 children, Hazim and another girl, Afifah. Today.. another task was given to me by the Almighty.I take it that way.. as everything happens with His permission. I received a phone call... asking me to explain to Adik Hazim what death is. It seems, they met up for dinner yesterday,Adik Hazim and a group of my friends. Adik Hazim asked.." is it painful when we die..."
That is my task to explain to him.. may Allah help me in delivering this task.. I hope he will enjoy the trip tomorrow.. and hope that his mom & siblings will remember this forever,insyaAllah.. I seriously hope and pray that he will recover... at the same time, i will be there for him, helping him to understand that from Allah we come, to Allah we will go back..
A mother has a wish. Her wish is to sew a blouse for her daughter who is under going chemotherapy. The reason is simple, as the girl is now 10 , she started to feel shy having to pull her t-shirt or blouse, every time the doctor comes to check her. 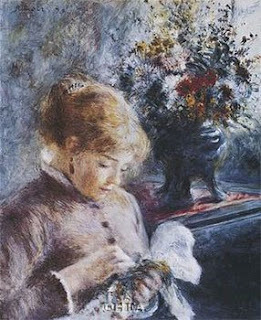 Therefore, the mother wants to give suitable blouse for her little girl. If there are anyone out there, knows someone who are willing to spend some time teaching the mother of how to do it, please contact me. My dream was to get someone to meet Adik Hazim, and talk about football with him. Simply because, I do not even know what off-side is. It started with only a skype chat with a dear friend of mine.. then it became a conversation with FAS coach. I thought it ended there. I never thought that one day, ASTRO would contact me with the interest of bringing Hazim to meet Manchester United players. This open up my eyes. I realised that there is nothing wrong to dream and to hope. That is what Wishing Well Programme is all about. A programme/project/event/moment that can bring up happiness, laughter, fun and courage to the children who are facing a battle in their life. When ASTRO contacted me, the only thing that have crossed my mind was.." if only I know if there are any other childhood cancer patients who need this.."
That will be my dream for now .. a dream to bring happiness to these wonderful children, regardless race, religion, status or gender...with the help of the lovely people out there, InsyaAllah..
That's the tears of joy, and of course all praise to Him. Today, Hani Liyana get to meet her idol, Tomok. Hani Liyana is an ALL ( Acute Lymphoblastik Leukimia ) patient. A sweet little girl, cute and an entertainer in the ward. According to the parents, she was so excited to meet Tomok when she knew about it. Dealing with these wonderful children, a habit of mine is, I will always inform about the surprise at the very last minute. I would love to keep it as a surprise though, but making sure they are at good condition is important. Therefore, I told the parents last night that Tomok is coming. However, she was shy. She really enjoyed listening to Tomok's performance.. yet, when Tomok asked her to sing together, she just shook her head. Sweet. .. to name all..countless. Along the road i have met so many people with kind hearts.. today, MyTV3, Media Prima & Tomok added to my list. To those who have been helping me to do what I am doing right now..only Allah can repay your kindness.You who keep on giving me ideas, support me, transport me when I wanted to meet them, listen to my stories..subhanaAllah... I LOVE YOU ALL. I remembered my aunty used to say, " It is not how expensive the thing is, it is the thought that counts "
This post was posted in FB too, dated 7th June 2009. Alhamdulillah, today we celebrated birthday for the June Kids. Adik Fizani, Adik Najihah and newly admitted Adik Izham are the birthday boys and girl. With the support given by the parents, now we have a simple but meaningful database,which is very useful for me to plan events for the little heroes. There are new faces every time I go to the ward. As for Adik Izham, he was confirmed having Acute Lymphobastic Leukemia on his 5th birthday, which was last Friday. His parents are still in shock and I can see his mom is fighting not to shed tears in front of me.The best I can do is .. be a listener.. There is this girl that I hope to see her smile. She is going through a high dose chemotherapy, insyaAllah, this will be her last cycle. Hopefully, she will be strong next month.. as she will be the recipient for the next project, insyaAllah.. please pray that things will turn out fine. Oh yes, I am in the middle of drafting programmes for STFOGA to do the weekday ward visit. When I was informed that my STF sisters are interested to be involved, subhanallah... Allah answered my prayers to have more volunteers.. only Allah can repay your kindness..
May Allah bless them all.. InsyaAllah. The FAS was so thoughtful and kind to let us in the stadium earlier and taking photos everywhere. Many many thanks to Coach Devan, Coach Odi & everyone in FAS. May Allah bless you all. It is very difficult to explain my feelings, but seeing Adik Hazim enjoying himself was a GREAT gift from Allah. Adik Hazim was accompanied by Adik Rohaizad & Adik Islah who are also cancer patients, or as I always refer to them as the real heroes. Maybe one day, I will post a note of what exactly happened on that day. Meanwhile, my brain have started to plan more events/program to cheer up these kids. As I explained to the parents, this will not be my first and last project, and this is not just an event to fulfill a last wish. I would take it as an event to bring the smile, laughter & happiness to the kids, that sounds more like it :) I believe Allah know what is the best for all of us. I leave the fate to Allah, but we will continue doing what we are doing right now.There are many unfortunate kids out there who may not be able to do what we, adults are doing right now. Maybe .. they will never get to know what university life is, working environment and in fact will never know what falling in love is. Believe me, we are VERY lucky for given the chance to live by Allah. Adik Hazim thanked everyone who have prayed for him. He said " Terima kasih aunty & uncle, Hazim seronok"
Something that started very small.. Subhanallah..
Adik Hazim is one of many patients at Ward 4D ( Oncology Ward , PPUKM ). Adik Hazim is a 15 year old boy, who loves football very much. Currently, Adik Hazim, who is at Stage 4 of Hodgkin Lymphoma, has been discharged from the hospital. Project Hazim is a small arrangement that being made, in a short period of time and with the help of so many wonderful people out there. May Allah repay your kindness. I hope and pray this will bring a smile to Adik Hazim,and for a moment, made him forget the pain that he has to go through everyday. The cancer has been spreading very fast recently, meaning the chemotherapy and radiotherapy did not work. Furthermore, the family has been informed that medically, nothing can be done anymore. What touched me most is the sms he sent me one day.It goes something like this.. "Aunty,bila kita nak belajar? " This sms was before the cancer spread.Adik Hazim has been missing school for almost 2 years. However, he still looking forward to sit for PMR. We used to have study session, but now, as he becomes tired easily, I put on hold those tuition session. I pray and hope that all will turn out fine tomorrow. May Allah give him the strength and let him be fit to meet the players that he admires and watch the match LIVE with his mom. I was only informed yesterday that the swollen lymph nodes in his brain may trigger fits anytime. Adik Hazim was informed of this project yesterday by myself, and he keep on sms me till late at night asking about it :) He must be looking forward for tomorrow, and who knows,maybe keep on looking at the clock. I made him promised me that should he feels sick he MUST let us know. Honestly, I am worried about the fits, but the Selangor coaches and the team are looking forward to meet him. Coach Odi said they pray things will be OK, and that gave me a relieve. Alhamdulillah.. finally, I am posting in this blog. this blog is created specially to the children who have captured my heart, regardless race, gender, status or religion. To me, they are just children, who deserved to be nurtured, loved and cared for by all. Wishing Well Programme is a programme to give support and boost the spirit and courage of childhood cancer patients.